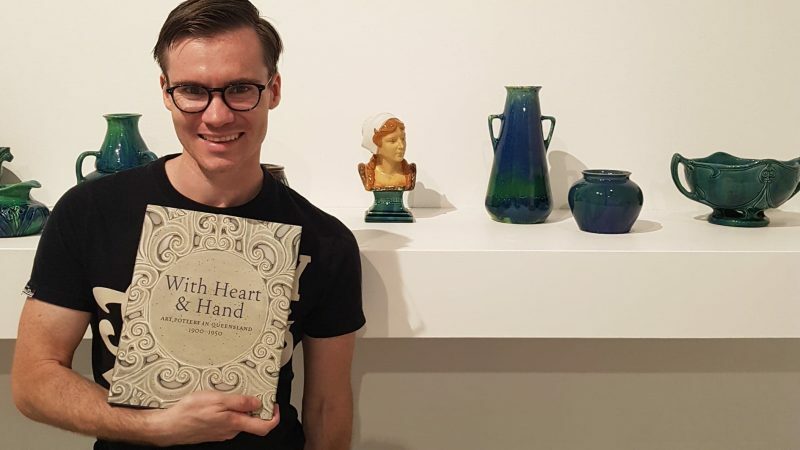 PHA Qld member Tim Roberts recently completed a 2-year mentoring program at Griffith University Art Gallery under eminent Queensland art historian Glenn Cooke and curator and Director of Griffith University Art Museum, Angela Goddard. During this time, Tim assisted the development of a major publication and accompanying exhibition on the history of art pottery in Queensland. Titled With Heart & Hand: Art Pottery in Queensland 1900-1950, the publication is the largest volume ever produced on the decorative artists of an Australian state, and references important practitioners and major schools of artistic production in Brisbane, Ipswich, Toowoomba, Warwick and Rockhampton. Tim has contributed artist essays on Clem Ainslie, Bessie Devereux, Muriel MacDiarmid, and Daphne Mayo to the publication, as well as a brief history of Stone’s Bristol Pottery at Coorparoo, and the first-ever survey of china painters and pottery decorators in Queensland. Copies of With Heart & Hand can be purchased from Griffith University for $125.00. A signed edition with an original print by contemporary artist Michael Phillips, limited to 65 copies, is available for $295.00. The accompanying exhibition is open a the Griffith University Art Museum, Southbank Campus, until 3 November 2018. Further details about the publication and exhibition can be found here.